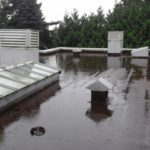 West Van roof with serious water ponding issue. A North Shore or Sunshine Coast inspection which is schedule for a rainy day is a big plus for the buyer. Although the inspection will be somewhat uncomfortable, the information gathered on performance may be invaluable. Strange title… sure, but it does aid in a home inspection. If you plan to purchase on the North Shore (North or West Vancouver) or the Sunshine Coast (Gibsons to Sechelt), and especially if your home is close to the mountains, then having a home inspection done in the rain or better yet, a heavy downpour, has its advantages. And that’s just for the exterior. The interior is another issue and will be the subject of a future post. Yes the inspection requires rubber boots and raingear, not to mention towels, especially for the buyer who wants to participate in the inspection. However the stormy weather does clearly display failure modes that otherwise may only be suspect. Use the weather to your advantage! A home inspection in the “wet” has its benefits.